Listen carefully because I am about to reveal the secret to becoming a more successful fly-fisher. Spend less time fishing and more time observing. Most of us never have enough 'fishing time' so when we get an opportunity to fish we waste little time getting after it. Unfortunately, this may prove to be counter productive, and result in fewer opportunities to maximize our opportunity to actually connect with a fish. In our haste to get into the water and begin to fish it is likely we will waste several valuable opportunities to actually hook a fish because we haven't the vaguest idea what the fish are doing. Vince Marinaro was one of the keenest observers I every had the privilege of fishing with, and his powers of observation were well honed from years of observing trout on his beloved Letort. If you have ever read any of his books, and if you haven't you have failed in your education as a fly-fisher, it would be obvious that it was his carefully honed observation skills which marked him out as one of the truly outstanding trout anglers of our time. His approach was a study in the unhurried approach to angling, because Vince knew the importance of taking time to observe. When Castwell and I fished on the Au Sable River in Michigan we established a routine that rarely varied. Before we began to fish we always spent a few minutes quietly sitting along the stream observing. We would select a spot where we had a clear view of the area we hoped to fish, and settle down on a handy log. Sometimes we would spend long periods of time just sitting, but it was more than merely an idle indulgence. We used the time to tinker with our tackle, smoke a pipe full (we were pipe smokers in those days,) but always we were watching the water. When we did begin to fish we had a pretty good picture of what the fish were doing, where they were feeding, and on what the trout were feeding. Over time we developed a reputation as being successful anglers. I could regale you with tales of angling opportunities that I missed or generally screwed-up because I did not take the time to observe before I began to fish. One particularly memorable moment happened many years ago on the Madison River in Yellowstone Park. The general fishing season begins the last weekend in May in Yellowstone National Park, and for many years I shared a tradition with several friends of fishing the Firehole and Madison on the opening weekend. This was always an iffy proposition since the weather at that time of the year is very unpredictable, and normally we would find the streams, especially the Madison unfishable due to runoff. However, if we hit it just right the Firehole and the Madison would have a good caddis hatch, and the fishing would be hot even if the weather wasn't. This particular year both streams were in good shape, and the caddis hatch was excellent. It was our practice to hit several places along each stream looking for rising trout, and on this day we spotted a number of fish feeding on a long flat just below 7 mile bridge. We quickly parked the car, grabbed our fly rods, and approached the stream. I could see several rise forms on the far side of the river, and promptly set off to cross the stream to get in position to cast to the risers. As I approached it seemed that the rise forms more closely resembled white fish rises than trout. Thoroughly discouraged to think that I had waded across the river only to discover a pod of feeding white fish I continued wading right into the rising fish. Suddenly I realized that the risers were not white fish but fairly sizeable brown trout, and they were now scattering for parts unknown. Had I taken a couple more minutes to observe more carefully I would have likely enjoyed some great angling. Most mistakes are made when we fail to spend enough time observing the fish as they are feeding. Usually we just grab onto the obvious, or we pick out some old favorite fly and start pounding the water. When that approach fails we change flies, change leaders, move to a new location, or just scratch our heads. It's time to slow down, sit down, and look. While observation is the key to most angling situations it is not enough to merely look but you must truly see. Any artist can tell you that in order to paint or draw you must learn to see, and the same thing is true for anglers. If there is some surface activity, what do you look for, and if the stream surface is an unbroken sheet what do you look for now? It's this ability to see and translate what you see into something that has meaning that separates the good from the best. The Big Horn River in eastern Montana is known for its tough trout, especially when they are feeding on a specific hatch. I have spent many hours fishing this demanding fishery, and more times than I care to admit the trout have been smarter than I. Careful observation, a stealthy approach, and precise casting are all essential for anything more than occasional success. I love to fish the rising fish on the long slick flats where any false move will send every trout within casting distance streaking for parts unknown. While my failures outnumber my successes in this game, when I have gotten it right, I have enjoyed some of my most memorable angling experiences. Midges hatch in the uncountable millions on the Big Horn, and they provide some of the most challenging angling opportunities. Since midges of some sort hatch almost every day, the trout become well acquainted with what they look and act like, and this makes matching the hatch an even greater challenge. On one occasion my nephew and I were on the tail of a large flat late on a warm spring day. The midge hatch was sparse but steady, and the trout had settled into a steady groove of slow head and tail rises in the thin flat water. We pulled our Mackenzie boat up at the tail of the flat and sat in the boat watching the fish. I readied my one weight rod extending the leader and reducing the tippet down to 6x. We ate a few cookies and washed them down with some hot tea, and continued to watch the rising trout. Finally I slipped over the side of the boat being very careful to not create a wake or crunch the gravel under my feet. Like a great blue heron stalking a meal I slowly worked my way directly below several rising trout and began staring intently at the water. By bending down to within inches of the water surface I could occasionally see a small dark midge emerger. They were small, easily a size 24 or 26! I selected a pattern that my nephew had developed, a small sparse pattern with a tiny grizzly hackle feather tied in to imitate the shuck. I dressed the fly and the first few inches of the tippet lightly with a paste floatant, and then I waited. I watched the closest riser, carefully timing each rise until I established a pattern. After several more minutes I felt confident enough to strip off some line and make a cast. Using a side arm cast I powered the cast low and hard just over the water, and with a sharp tug on the line I hooked the fly and leader into the drift line over the trout. No luck, but the trout did not spook or appear nervous. I allowed the cast to float almost back to my feet before I picked it up and presented it again. I was confident in my choice of pattern based on my observations. 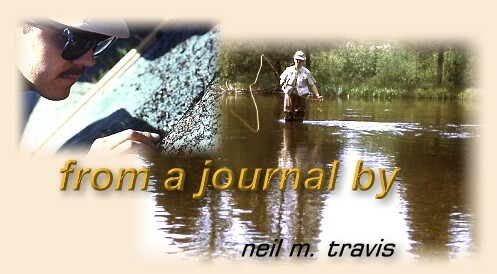 I continued to cast several times until the trout tipped up confidently and sipped in my fly. Meanwhile my nephew had waded across the flat below another pod of rising fish, and soon I heard the scream of his reel as a fine rainbow took to the air. For the next couple hours we gradually worked our way up the flat both of us catching and releasing several 18 to 20 inch fish.